A vegan shortbread cookie recipe with Christmas flavor from almond extract. 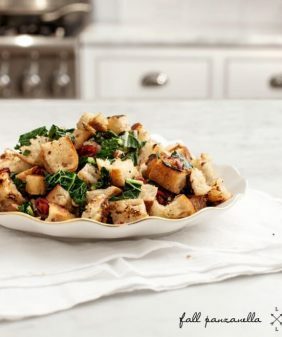 Incredibly easy and fun - delicious with your favorite add-ins on top! One of my most cherished childhood memories is baking Christmas cookies with my mom. She would pull over two kitchen chairs for my sister and me to stand on so we could reach the countertop and get our hands in the flour. We’d watch her line up all of the ingredients, preheat the oven, and prepare the cookie sheets. Last weekend, I finally got around to some Christmas baking. This isn’t one of our traditional family recipes, but let’s just say it was inspired by my memory and the “Christmas” smell of almond extract. 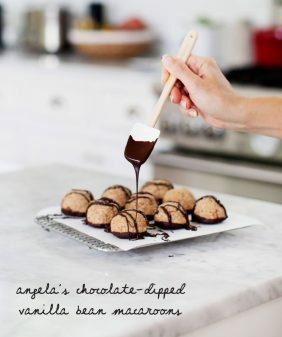 I’m kind of in love with these cookies because of the minimal amount of ingredients. And as far as baking goes, they’re pretty foolproof. 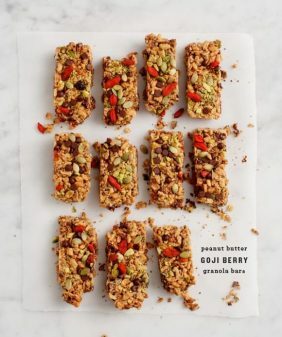 I subbed in as many “healthier” ingredients as I could, but they’re still a pretty sweet and buttery indulgence. 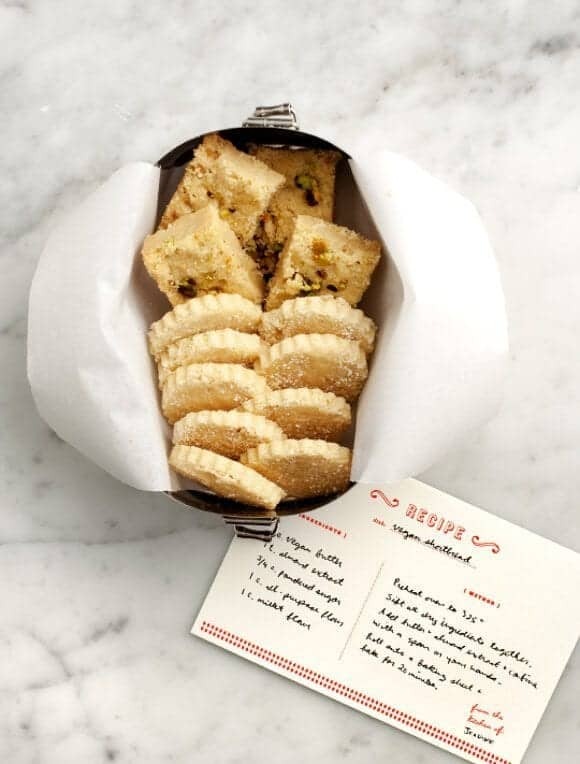 Pass down your own recipe memories by giving the gift of handwritten recipes… (because your own writing says love better than a recipe in an email). Order your recipe cards by Wednesday for pre-Christmas delivery. Click here. These vegan almond shortbread cookies are just like my mom's buttery Christmas shortbread without the butter! A holiday cookie favorite. Sift together the flours, sugar, and salt, if using. 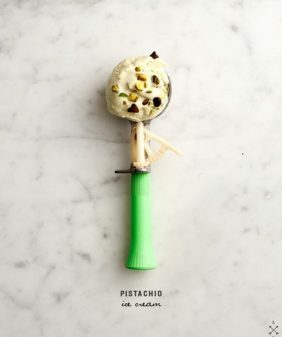 In a medium bowl, use a wooden spoon to mix the butter and almond extract together. Add the dry ingredients and mix everything together. Use your hands if necessary to incorporate the butter and get the dough to come together. Your dough will be pretty crumbly. Stop when it has just come together, don’t overmix. Form it into a ball. For cutout cookies: roll onto a nonstick baking sheet (I rolled pine nuts into the top of my dough), until your dough is about ¼ inch thick. (If the dough is sticky and you’re having a hard time, put it in the fridge for a little bit so the butter in the dough stiffens up). Bake for about 20 minutes, until the dough starts to turn golden brown. Remove and let cool almost completely before you cut out your shapes. You’ll have a lot of “scraps” with this method and will yield less finished cookies. 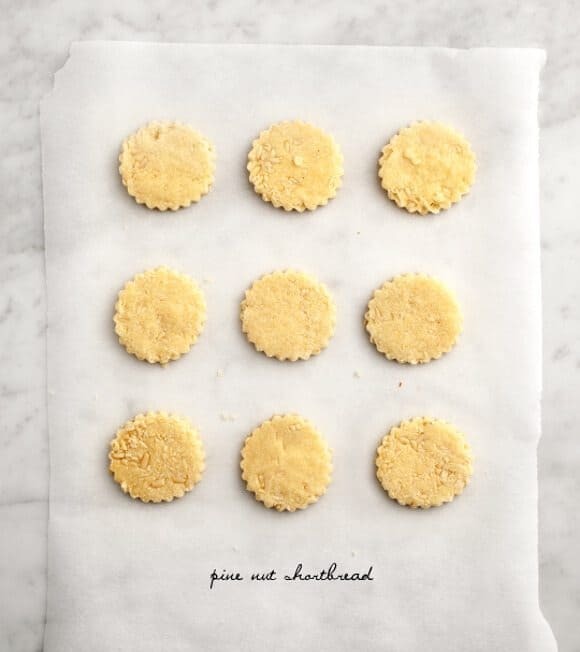 For square shortbread: Press dough into an edged baking pan along with any toppings you like. I made a half recipe and used a 5×7 pan; my cookies were a about ½ inch thick. Since they were on the thick side, I baked these for about 30-35 minutes, until they started turning golden brown on top. The time will vary depending on the thickness, so just watch them. Once they’re done, let cool and then slice. 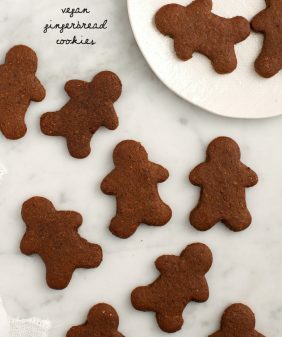 *I found powdered sugar made the dough easier to roll out for the cut-out cookies. I used organic granulated sugar, which is more coarse, for the squares. Wow, these look like the homey, and yet somehow perfectly magical Chrismases of my childhood. I can smell the almond extract from here. I’m dying over the thickness of these cookies! I may have to experiment and see if I can make a GF version. Shortbread cookies are an all time favorite of mine. I am going to make them with millet and chickpea flour! thanks Winnie! Ha, I was out of coconut oil that day (which almost never happens). 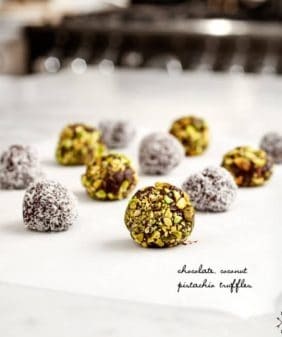 I have a question, ¿how can I make these with coconut oil? since I do not have access to vegan butter in my area. Did the coconut oil work well? Hi Natalie, it didn’t work for me as a 1:1 exchange in this recipe. Yum! These look delicious. And your recipe cards are super cute! Baking cookies and treats with my Mom is one of my most cherished Christmastime memories also. Great post. And I love all the vegan recipes you publish. 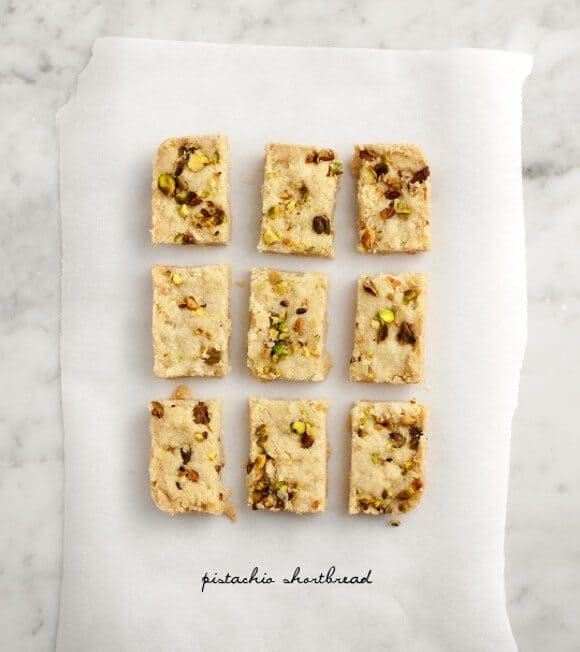 In a world of fancy cookies, it’s very hard to beat a simple square of shortbread especially when it’s as beautiful as these are. With regards to the comments about about gluten free flours, I make shortbread with a mixture of rice flour and cornstarch which seems to give quite a nice texture and taste. Yammie and health, the best combination! This is so sweet! I have memories just like that with my mother and sister. This would be a great gift to have to sit down with her and transcribe those butter-stained cards! My grandmother was famous for her shortbread. Your vegan version looks fantastic. I’ve been wondering if coconut oil is a good substitute for butter in shortbread, and I’m procrastinating from work right now, so maybe I will give it a try this afternoon! Baking with my mom and my sister is my favourite Christmas tradition. We always make shortbread, mexican wedding cakes and gingerbread. Mom also makes a delicious caramel corn every year that i devour in record time. These cookies look fantastic. Love the addition of pine nuts! Absolutely beautiful photography. These recipes look truly declious. To be just, though: almonds are not vegan. Delicious cookies! I tried it with coconut oil…only recommendation is to make sure that the oil isn’t too solid. Melting it just a tad helped the dough come together! Were you able to substitute 1:1. Coconut oil for vegan butter? I’ve used your recipe twice now, with great results. I use half coconut oil and half Earth Balance. The recipe has even made it into my handwritten recipe card collection. 🙂 Thanks! powdered sugar is icing sugar ?